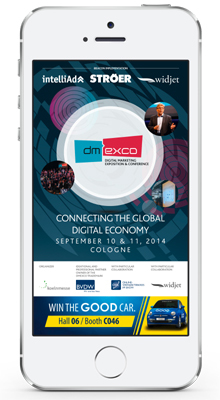 The official dmexco App is being launched just in time to coincide with dmexco 2014. With its optimized App version, dmexco is once again offering a complete range of mobile support features that will make a visit to the biggest top-class show in the global digital marketing industry as smooth and effective as possible. The dmexco App offers a practical map feature that provides an optimal overview of the show’s fully occupied three halls. The App’s Conference Overview presents complete information about the trade fair program and all dmexco Conference speakers. The App also offers many other practical features in both German and English, all of which visitors to dmexco will greatly appreciate. These features include a system that provides all key information needed for a visit to dmexco, such as directions to the venue and information on the check-in process and the party. The App can be used to create your own personal dmexco schedule and comes with the proven networking tool with fast card exchange from App to App and direct contact-export capability for follow-up communication. The dmexco App 2014, which was developed by widjet, can now be downloaded free of charge: You will find the links for iPhones, iPads, and Android devices at http://widjet.de/dmexco/. For the first time, dmexco visitors who install the latest dmexco App and activate their Bluetooth connection will receive additional valuable information from beacons provided by intelliAd during the fair. These services will be available directly on user’s mobile devices in the area surrounding these dmexco contact points and include a dmexco route guidance system and information on catering and restaurant sites and the Congress areas. http://www.dmexco.de/2014/en/brandwatch.html. The “dmexco Socialhub” from Pilot & Talkwalker at http://www.dmexco.de/2014/en/social-hub.html will display in real time the most relevant dmexco postings, the most viral dmexco tweets, and the best dmexco Instagram photos. The new Start-Up Village at dmexco 2014 is also sure to be the focus of a lot of attention. This new venue developed by dmexco especially for promising young start-ups has already been completely booked by around 30 companies. Along with a special lounge area, the Start-Up Village will also have its own stage where digital industry trendsetters will present their ideas and visions. The complete program for the Start-Up Village stage is now available online at http://dmexco.de/Conference/en/StartUpVillage.html.